Description: #WMLABTALKS event – inspirational thought-provoking lectures. 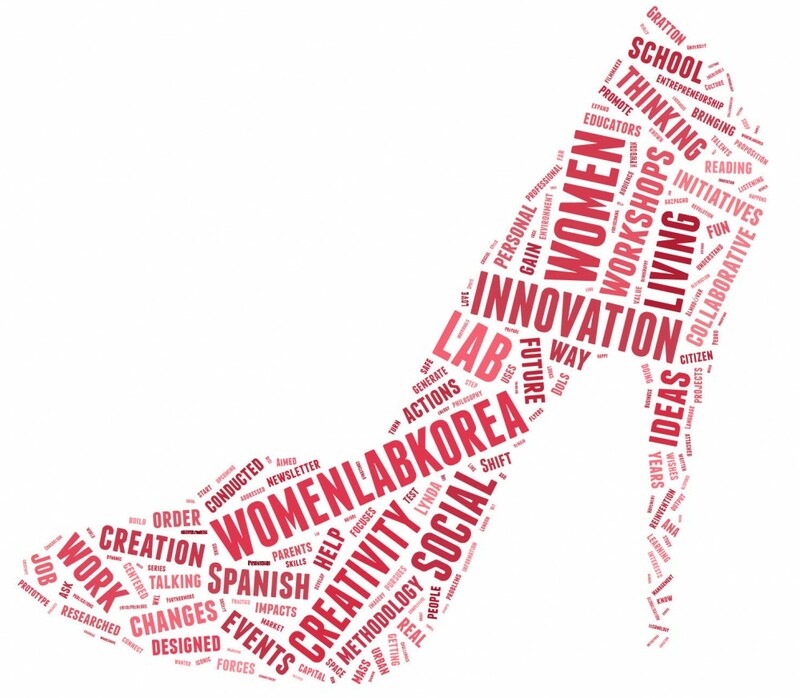 At womenlabkorea, we are inspired by remarkable women and women’s organizations, and so we set out to tell stories that highlight women’s lives and their role in South Korea. We believe that one voice or one story can make a difference and that is why we are rallying female entrepreneurs, expat women, nonprofit founders, bloggers, and more to share their voice and insight. 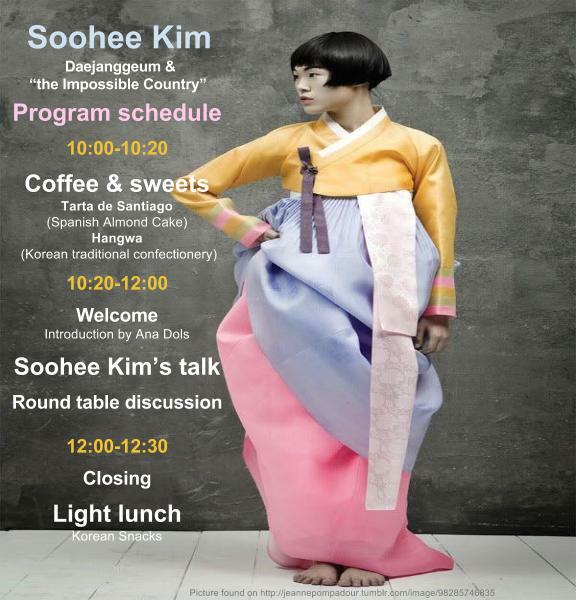 This time our speaker will be Soohee Kim, a Korean entrepreneur and Korean Language teacher. Inspired by the true story of Jang-Geum, -an apprentice cook that became the first female royal physician of the Joseon Dynasty-, Ms Kim will tell us her own story of perseverance and her own vision of this fascinating country’s impressive achievements. Daejanggeum TV Series Original Picture. All proceeds will be donated to programs supporting North Korean refugees and participants’ support will make an enormous and powerful impact. Next Thursday, December 3rd will talk too about Dae Jang Geum (Hangul: 대장금; hanja: 大長今 also known as Jewel in the Palace, a 2003 Korean television series directed by Lee Byung-hoon. This epic South Korean drama tells the tale of an orphan cook who went on to become the king’s first female physician in a time when women held little influence in society. 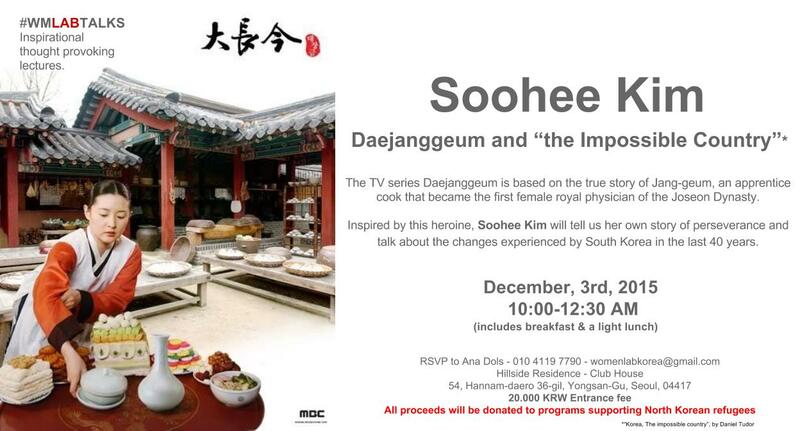 It is based on the true story of Jang-geum, the first female royal physician of the Joseon Dynasty. The main themes are her perseverance and the portrayal of traditional Korean culture, including Korean Royal Court cuisine and traditional medicine. The theme song, Onara (Korean: 오나라) is in Old Korean. The song is in the pansori style, a particular type of Korean music that emerged during the Joseon Dynasty and was very popular in the 19th century. This entry was posted in #WMLABTALKS and tagged Dae Jang Geum, Daejanggeun, Joseon Dinasty, Korean culture, Korean Women, South Korea by anadols. Bookmark the permalink.